Any/all of the links on DrJaneSanJuan.com are affiliate links of which I receive a small commission from sales of certain items, but the price is the same for you. As DrJaneSanJuan.com has grown, so have costs associated with running and maintaining it, and affiliate links are a way to help offset these costs. If I post an affiliate link to a product, it is something that I personally use, support and would recommend even without an affiliate link. 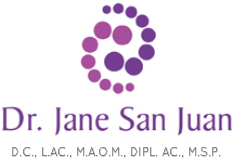 I do not allow ads on DrJaneSanJuan.com so clicking on any links on my sidebar or to posts within my site or to non-affiliate link external sites will not earn me commissions in any way. ​These statements have not been evaluated by the Food and Drug Administration. This product is not intended to diagnose, treat, cure or prevent any disease. If you are pregnant, nursing, taking medication, or have a medical condition, consult your physician before using this product.